Your kids are probably already asking for this one…we know cause we’ve been getting tons of calls from them! Magna Color is such a cool art design set, definitely not like anything else out there so it’s one that will impress the kids. 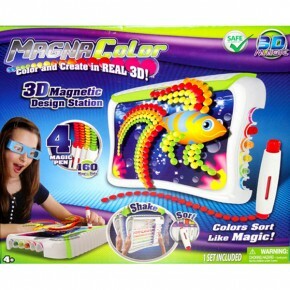 Magna Color As Seen on TV is a design set in which you use a special pen to create designs out of dots. Use the stencils provided or create your own. Put on your 3D glasses, also included, and watch the design pop out of the screen! How cool is that?!?! Then you sweep the dots back into their sorting system and your ready to create again. So nice that everything stays all together, too, so there’s no mess!